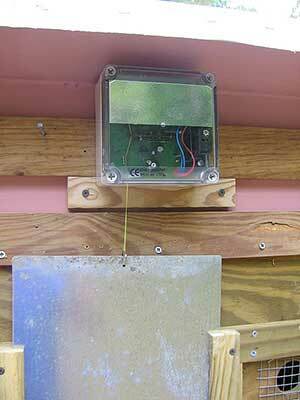 Electronic Doorkeepers are becoming more popular to lock up chickens after dark. 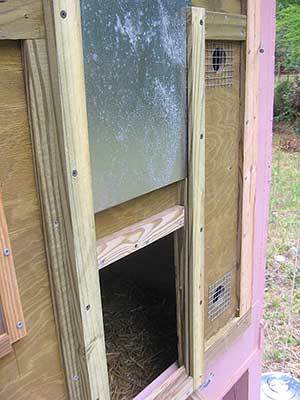 Jane is a poultry keeper living in North Carolina who installed a VSB door opener to keep her chickens safe from Raccoons and provided this review for us. 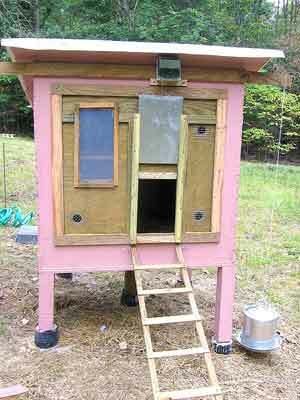 Here’s a problem with having chickens: they want to go in their house at nightfall and not a minute sooner. Tuesday, nightfall was about 7:21 pm. I had to be directing the Triangle Jewish Chorale at 7:30! After nightfall though, the Raccoon comes – I know because he gnawed the feeder off its string and unscrewed the wing-nut again, and hauled the whole thing off into the field. He would happily bite the heads off sleeping chickens. So if I go out before the chickens are in their house, I may come back to bloody disaster. Considering this, waiting impatiently until the chickens finally straggled up the ramp, I was late to rehearsal. It has a light sensor and a string which slowly rolls up, pulling the door with it in the morning, and lets the door down at night. It’s quite expensive but I decided if it means I can get to rehearsal on time, it’ll be worth it. I ordered one from Foys Pigeon Supplies, one of the few U.S. distributors. I’m offering this information for anybody who orders one and is as befuddled as I was (it came without directions but you can get them sent to you via pdf file). First, if you don’t want to pay $40-$50 (roughly £26 to £33 when bought in the U.S) for the door they offer, you have to make one. I used a piece of tin roofing left over from the donkey shed. I cut it with a table saw. Use a blade made for metal, don’t ruin your good blade! I drilled a hole in it at the top and added a small key ring. Then I had to make the channel in which the door will slide up and down. Using the table saw I took some scraps of pressure-treated wood, about 1″ x 1-1/2″, and cut into each a kerf (slot) for the tin door to travel in, both sides and bottom. I screwed the channels onto the hatch. I put the door into the channels, and miracle! It slides up and down just as it was intended to. I added a block at the top of the opening to reduce draftiness. The instructions warn sternly, “do not connect the unit to power (i.e. the 4 AA batteries) at this point!” They say: “Lower the string till the door is fully extended, and also adjust the knot for the ‘fully up’ position.” However, I had found an error! I called Foys and they said you actually have to get the VSB powered up and fool it into thinking it’s dark or you can’t extend the string. Well, there it is. I covered the light sensor with a black bag and it lowered the door very obediently. As for the front hatch: I added a window (part of an old storage box) and several peep-holes because the birds like to look out and squawk at me in the morning when I bring their food. …one problem with door openers is, they don’t “tell” you when the battery is dying. I went out-of-town, the battery died, and raccoons came and ate every one of my chickens (there were raccoon prints inside the coop)…. Electronic door closers can be purchased online from Amazon where there are usually a few different sellers offering them.